Haste gives me more energy, a quicker rotation, aswell as making my dots tick quicker. Crit gives me more combo points depending on ability. Currently there's two builds, with 3 variatons. For a very short burst window it can be optimal to use Master Assassin however it's not used often. The difference between Exsang and TB is very minor, and is fight dependent. I'm using Exsang because it sims higher for me atm. Walkthrough - Joined a few friends when they were forming in ToS, but at the time I wasn't on par with some of their raiders as they wanted to push for way higher than I expected. 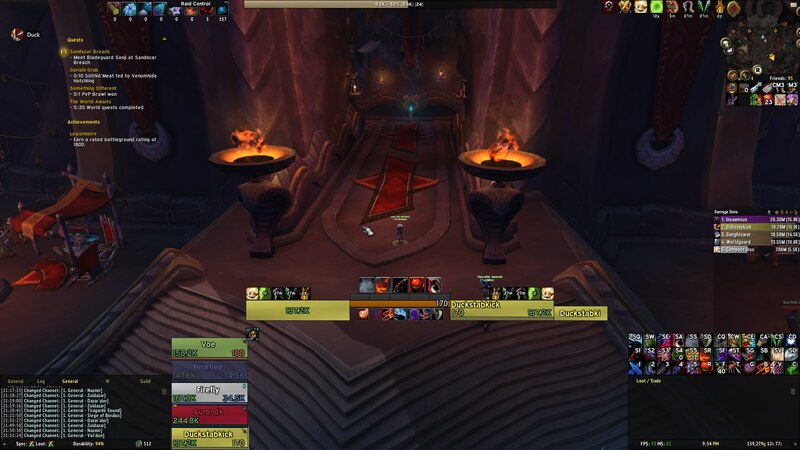 The Reckless - Joined mid EN, stayed until mid ToS, swapped to Walkthrough and after a break, came back to the guild in Antorus. Reason for leaving is the whole roster and officer team has changed, and I'm no longer enjoying the atmosphere. A guild with a stable background, consistent progression, friendly community with lots of banter, and preferably a community which does dungeons outside of raid time. A dedicated multi-class player looking to improve in any way possible, responds well to criticism, and always works on the same goal as the team. As I've played my Rogue as a main in this tier, I wrote the app for Rogue. I would like to play DH or Affli as main, DH might be more suitable as it's a melee and I've not raided Mythic as ranged this tier yet. I have a background of playing various specs and roles for my guilds in the past, the majority can be found on my rogues wowprogress page.